After such an incredible winter season, it’s easy to forget that climate change is starting to have an impact on the mountains we sometimes call home. What's happening is no secret. Increasing levels of greenhouse gases mean that more heat is being trapped in the atmosphere which disrupts weather dynamics and leads to a warmer, more volatile climate. In the Alps we’re witnessing a trend of declining snowfall, retreating glaciers and less predictable seasons. Some glaciers have lost approximately half their volume since 1900, making up around 29% of the observed rise in sea levels. We’re also in danger of accelerating this trend. Snow is great at reflecting energy from the sun, unlike rock and vegetation. As snow melts, a positive feedback effect begins: exposed earth aborbs even more energy and melts even more snow. Many of us are now operating trips on an unprecedented scale, equivalent to small festivals both in ambition and number of students attending. This means we surely have even more responsibility to make them sustainable to enjoy for years to come. In the face of such a global problem, there are many ways in which we can minimise our effect on the environment. Trip numbers are growing year on year and its out responsibility to ensure future generations can party as hard as we do! Transport is a major contributor of greenhouse gas emissions on ski trips. Taking the train uses 12 kg CO2 per person which is far less damaging than a coach, and significantly less than flying (122 kg CO2 per person). When you factor in journey time, check-in, delays, luggage collection and transfers, taking a plane isn't always faster or more convenient. While using the Eurostar and connecting trains have already been used for some uni trips, putting coaches on the Eurotunnel instead of ferries, which use huge diesel engines, is a great way to start reducing the emissions of the Channel crossing. Ultimately there’ll always be emissions associated with going on holiday. This year, Bristol offset the emissions of the recent trip for 2,000 students by putting a small charge within each trip place and buying over 6,000 tonnes of UN carbon credits. These credits finance projects in developing countries which help to reduce emissions, such as wind farms. Both Wasteland and NUCO can offer clubs the option to offset the emissions of their trips. Making all of them ‘carbon-neutral’ and pressuring our tour operators to do more to protect the environment will have a huge impact, not to mention being a hugely symbolic and influential move in the student community. Energy supply accounts for 25% of greenhouse gas emissions in the UK, so the more that comes from renewable sources the better. Energy suppliers like Ecotricity and Good Energy re-invest their profits into building more renewables. They offer partnership schemes to incentivise group members to switch, which is really simple to do and usually involves £50+ donations to a charity of the group’s choice for every house. It’s a no-brainer to make a significant impact across university cities, as well as raising money for good causes. Clean Energy UK compares a range of tariffs from a handful of green energy suppliers, including Ecotricity and Good Energy, to help make sure you’re getting a good deal. Textile production usually involves a lot of energy, water and polluting substances. In addition, worker conditions can be hugely exploitative, so there’s a big social cost to getting cheap clothes out to the UK. Companies like Silverstick, who supply a number of clubs already, are founded on environmental principles and use organic, FairWear cotton for their products. Ben Allen, Media Rep at Bristol said: “In 2017, we switched our trip tees to organic cotton. Not only has this reduced the impact of such a big clothing order but they fit better and shrink less. People wear them around campus more now which is ultimately far better marketing for the club”. While the idea of a veggie tartiflette at the mountain meal might send shivers down spines, the environmental impact of the meat industry is undeniable, with agriculture accounting for 10% of the UK’s greenhouse gas emissions. Beef in particular is known to result in the production of far more emissions than white meats such as chicken. Raising awareness of how significant this contribution is allows us to make more informed choices about the food we eat and hopefully lead to a reduction in emissions from meat consumption. Offering cheaper veggie food at meals is an easy way to incentivise this. We’re not on our own! 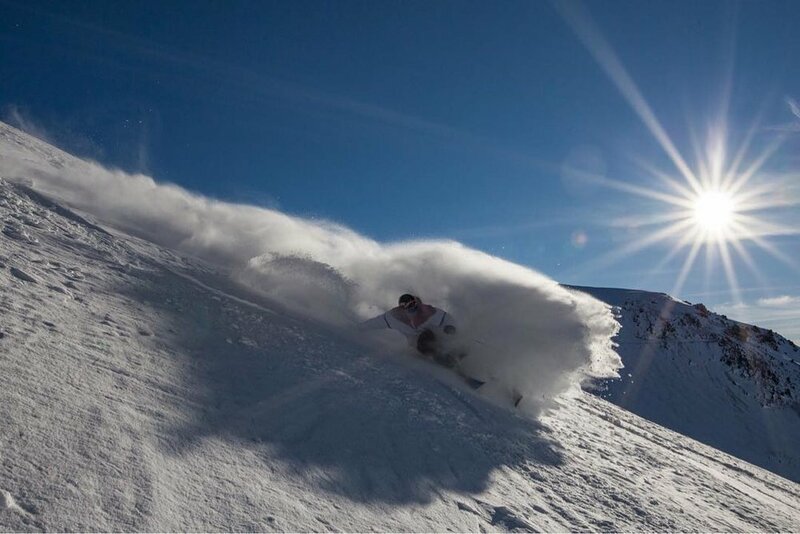 Protect Our Winters (POW) is just one group helping to reduce the impact of climate change on snowsports, along with Winter Alliance founded by some of the team at Jibworx. They offer a number of ways for clubs and individuals to partner with them. “POW is the leading voice on climate change for the outdoor sports community” says Archie Hawkes, former Edinburgh committee member who now works for the charity. There’s much more that can be done and these ideas are just a start. The world of student snowsports has always been incredibly ambitious, doing things nobody would have seen coming even five years ago. No doubt together we can come up with realistic solutions to one of the greatest global problems and inspire others to do the same. Many resorts are now focusing on reducing their carbon footprint, with sustainability moving to the forefront of priorities for the future. Laax in Switzerland is leading the way, find out how here.